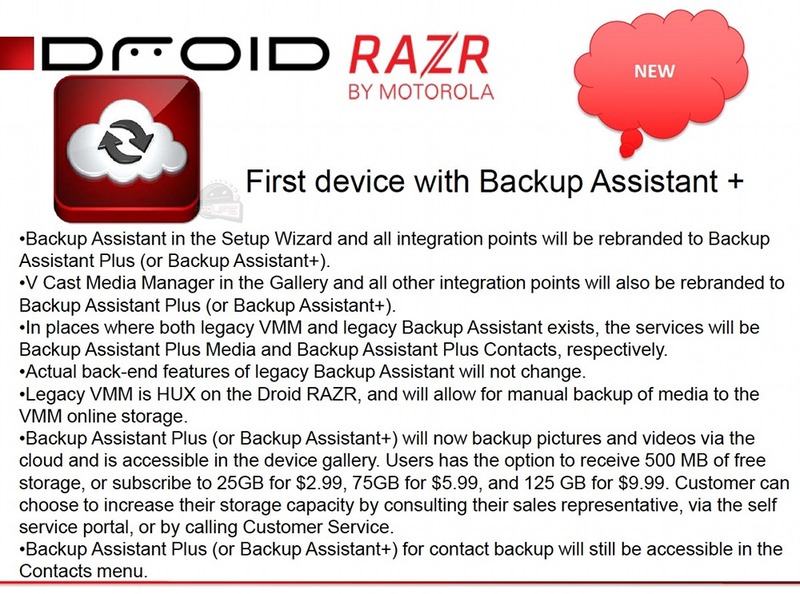 Not only will the DROID RAZR launch as the thinnest smartphone around, but it will include something new that I know all of you will not be able to live without going forward – the new Backup Assistant+. That’s a joke of course. This so-far-unannounced product is Verizon’s take on cloud storage for your media (pictures and video). Anyone who purchases this phone will get 500MB of free storage and can upgrade from there at a monthly subscription if they would like. Well, +1 to free storage at least. As far as Backup Assistant goes though, can we get rid of this product already on Android devices? All of our contacts are backed up and restored automatically through Google. Why do we need a separate service to attempt to do it for us? If you try and load them through Backup Assistant too, you get duplicates which might be one of the most frustrating smartphone things on the planet to deal with. And having to skip it to set my phone up altogether while bypassing its 2-3 verifications on why I want to skip is another topic for another day. /end rant.